Here we are again! Another Joy of Sets Challenge Blog entry! These do seem to come around fast. This time I went with a box instead of a card. The theme letter for this month is T and so I reverted back to type and went all out to get that letter T into my project which is a Tranquil Tide Tasselled Tulips Trinket Box. I used the Tranquil Tulips stamp set from Stampin' Up!. This is such a gorgeous set and allows you to multi-layer stamp which means you stamp on the detail using one stamp then add the colour using another. Obviously the two stamps are designed to fit each other so your two step stamping could not be easier. You can also add leaves and stems and stamens so you can go for it with colour combos if you wish. I didn't wish as I wanted to stick to the Tranquil Tide theme and to pop against it I went for the gorgeous Berry Burst as a contrast and stamped onto Whisper White to let the colours pop and to add more contrast..
As you can see even though the set is called Tranquil Tulips the tulip stamp was used very subtly as a background for the main stamping to create my own unique stamped dsp. I stamped the tulips in powder pink using a stamping off technique which takes off the majority of the ink and leaves a more subtle stamped image. I then stamped onto the Whisper White using the small flowers and dainty leaves stamps from the stamp set in Berry Burst and Tranquil Tide. These little dainty designs are so cute and perfectly pretty for a little trinket box project. 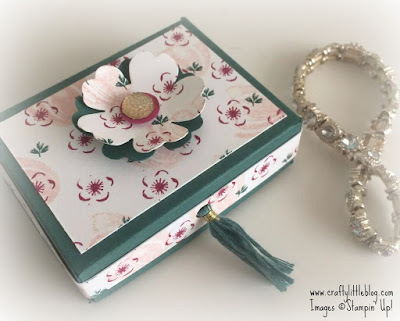 The main box is made using Tranquil Tide cardstock with the handstamped DSP glued on top and a band glued in one strip around the outside of the lid. 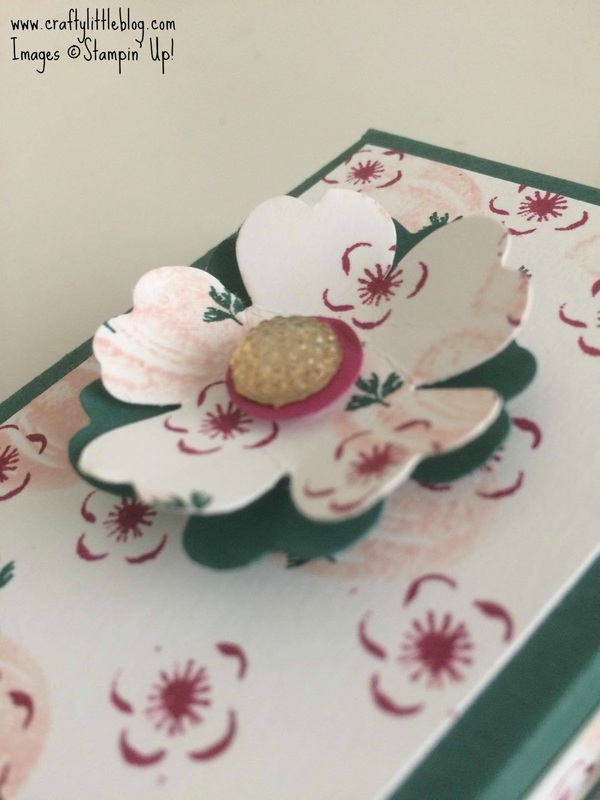 The pretty little topper is made using the pansy punch to which I added a Berry Burst punched circle using a half inch circle punch and a gold faceted gem. It's all finished off on the outside with a Tranquil Tide tassel opener. I added a Just Add Text stamped sentiment inside the lid, of course using Tranquil Tide to keep with the T theme and if you didn't notice the T also comes through in the stamp set and the tassel, so there was plenty of T action. I hope you like this project and that it inspired you to get your papercrafting skills out and give making something a go. Don't forget to go to the Joy of Sets Blog (clicking the link at the beginning of this post will take you there) and check out all of the other fab T themed projects shared there. 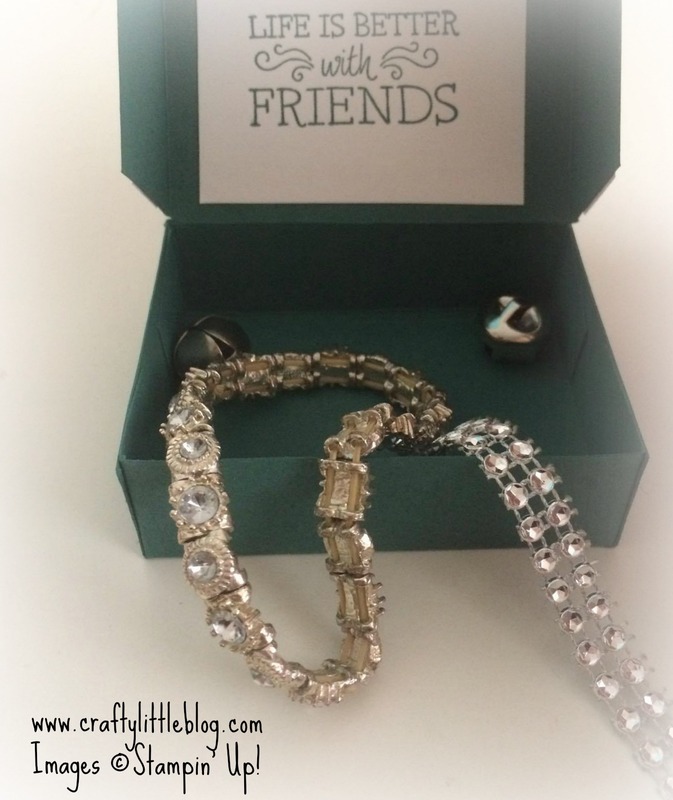 All products used are as always linked below, all are current Stampin' Up!. Thank you Christine. I always think of Tranquil Tide as such a bold, strong colour which goes great with strong patterns so I loved matching it up with this really delicate ditsy pattern and finding that it goes just as well with this kind of thing. Stampin' Up! presents us with endless choices. It's why I love it! 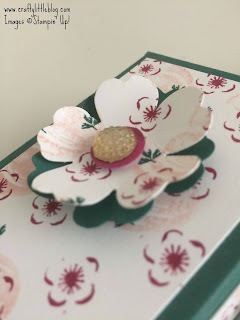 Love this little box, Andrea, the colours are great together and it's such a nice change to seeing cards.